Tap between 10 and 11 to start/stop chrono. Tap between 1 and 2 to reset. 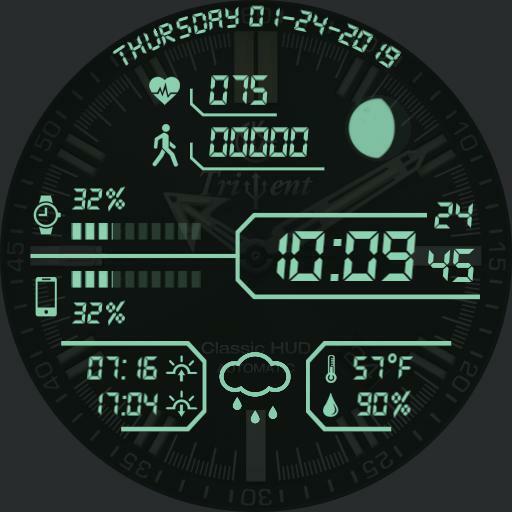 Tritent mode - Tap 3 area to cycle dial colors. Tap 12 area to zoom. Full/Flat modes - Tap 3 area for Time modes. Tap Temp area for Weather modes. Tap SR/SS area for Compass. Tap 9 area to turn off Heart Rate. Tap 6 area for date format. Tap Center for dim mode menu. Tap 3 area to cycle face modes Full, Flat or Tritent. Tap Color text to cycle analog dim mode color. Tap Mode text to cycle dim modes Normal, Always On, Auto Always On, Auto Always Plus and Off. Tap OPR to darken dim 15%. Tap X to close. Seconds hand is watch battery level indicator on dim.